Here is a gift for that special someone: a custom portrait. While some like to surprise loved ones with the finished product, others like to give gift certificates. In this way the recipient can enjoy the whole process from choosing photos they want to use for their pet portrait to the finished painting. If you would like a more non-standard size, please ask and I will be happy to accommodate. Gift certificates can be purchased and will be mailed USPS first class either directly to you or to your intended recipient. Anywhere from 2 - 6 weeks, depending on my workload at the time. 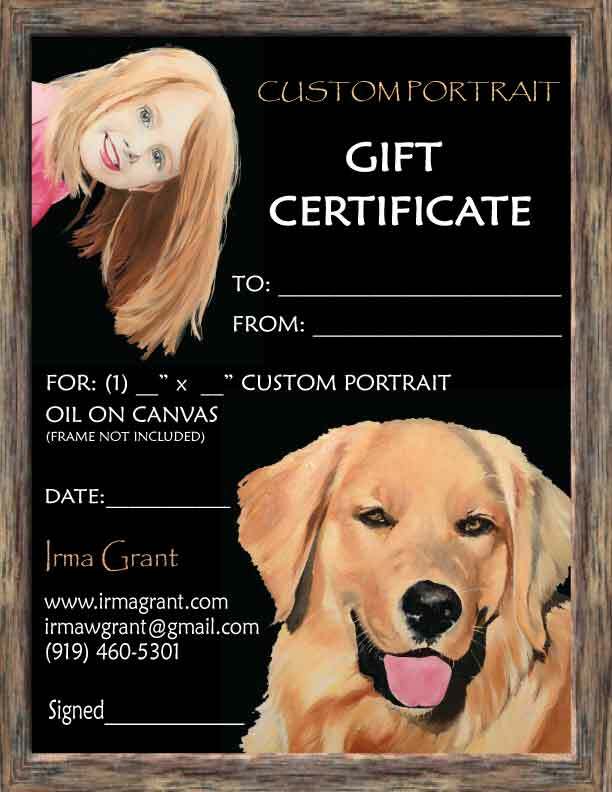 The recipient of the gift certificate may contact me any time after purchase to arrange the details of the commission.